Wholesale sausages for as little as £11.20 for 20 (80g/18cm pork hot dog). That’s 56p per sausage! We specialise in supplying the very finest wholesale hot dogs in the UK and German sausages, as well as a truly excellent range of cooked and smoked products from award winning butchers in Germany. The Sausage Man is proud to have become the premium German butchers in the UK! We supply establishments with premium quality products to the highest of standards! We import our meats & sausages from award-winning butchers in Germany weekly! Best Hot Dog & German Sausages UK Suppliers! Our brochure is packed with fantastic products. We keep adding new products to our range regularly. Download our brochure by clicking on the link below. Inside our brochure you will be able to browse through a comprehensive range of authentic and freshly imported German hot dogs, sausages and condiments. Please let us know if you require a special product and we will be delighted to have our butcher in Germany supply exactly what you want. We are specialists of premium gourmet hot dogs in the UK, order your German sausages online by contacting us today. Remember: many of our products are recognised by the German Agricultural Society as the best of the best! 10 Reasons Our Customers Prefer Us! Here's what our customer LOVE about us. We are a dedicated German butcher (London based).The Sausage Man Ltd was founded in Lewisham in 2005. For ten years we have been importing and distributing fine German sausages throughout the whole of the UK, offering an extensive range of quality award-winning sausages, carefully selected for today’s discerning customers. Our 20 different butchers are small to mid-sized family run businesses, located in the southern region of Germany – all producing high quality, award-winning sausages. We are proud to run one of the most distinguished German delicatessens in London and equally proud to supply the rest of the UK. If you’d like to place an order and join hundreds of happy customers, just contact us. Looking for sausage supplies? Let us become your UK hot dog and sausages suppliers: we have a range of fantastic German meats as well as other fine gourmet products. Our dedication and focus on quality and service has enabled us to retain a loyal customer base while remaining competitive, and yet that’s just part of the story, for we constantly review and source new products to meet topical challenges and demands. More than 300 Different Types of Sausages! We have access to more than 300 kinds of German sausages, so you will always find the right product for your clients and catering requirements. Our brochure shows only a few products – please let us know which product you are looking for and we will happily contact our butchers in Germany to make sure we can provide it for you. Browse through our website to find some of the different German products (UK) we provide. Whether you are a butcher or the owner of a fine deli, you are sure to find something convenient for your business at The Sausage Man. We provide you with all the hot dog equipment you'd ever need! 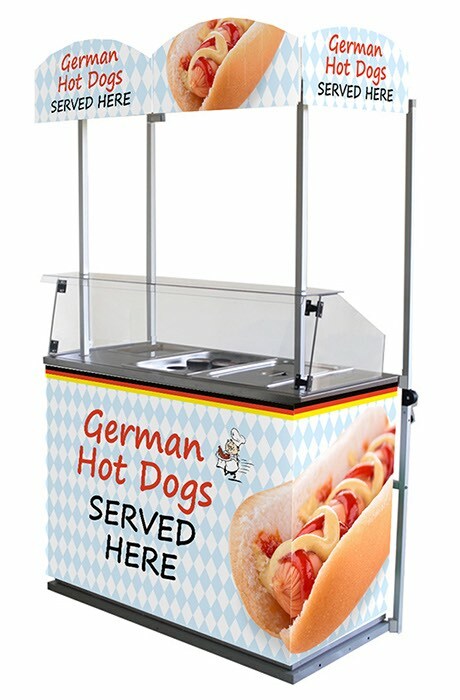 Hot dog stand, hot dog steamer, hot dog roller, hot dog grill, hot dog station, hot dog holders, ketchup & mustard dispenser, crispy onion dispenser, pavement signs... you name it, we've got it! With us you can buy or rent any/all of the equipment and point of sales materials. It is very inexpensive to get you started and a lot easier than what you think! No one can't beat us when it comes to quality. We're the German REAL DEAL! Remember: if you require a special sausage or product, simply let us know and we will ensure our butcher in Germany supplies it for you. View or Download our Products Brochure! Try our imported German meats and discover the great taste for yourself. Give us a call or simply contact us.